The Cahill brothers, Robert and William, were on their way to a dance at the old Central Turner Hall on Walnut Street when they met the clowns. The Cahills, along with their friends John Finley, Ernest Bratt, Robert Hackett and Clarence Weise, were walking along State Street in Lower Price Hill, heading for the street car on Eighth Street. Along the way, they came upon three men dressed in clown costumes. 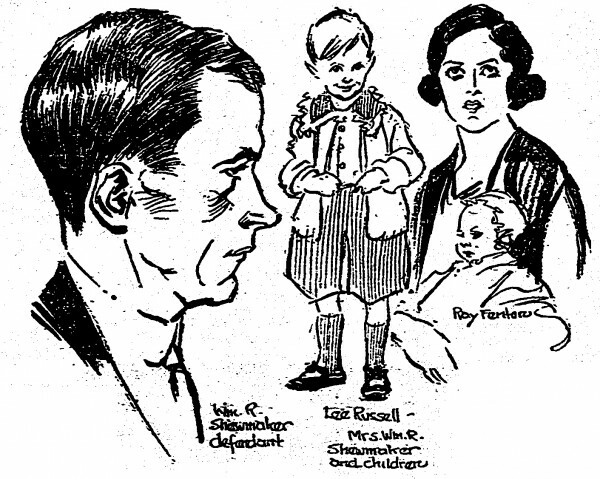 While on trial for murder, William Shewmaker was sketched by The Cincinnati Post‘s courtroom artist, who included illustrations of the defendant’s family. A witness, Morris Vangerovsky, a real estate broker with offices in the nearby Second National Bank building, told a different tale, according to the Post. The three men shot by William Shewmaker while wearing a clown costume. Joseph Clark died at the scene. Robert Cahill died a week later. Robert Cahill’s wounds proved fatal. He died a week after the shooting. The clowns fled down Hatmaker Street. A short time later and several blocks north of the shooting, a man masked as a clown ran into the Half-Way House bar at 1434 State Avenue to wash his face. He told those present he had been attacked. To complicate matters, police who responded to the shooting found a fourth clown, “wandering in a dazed condition” near the scene of the shooting. She turned out to be a very inebriated Mrs. Billie McDowell, who ran a rooming house on Vine Street. Mrs. McDowell was so intoxicated, she thought she was in Newport and was thoroughly confused by officers asking about three other clowns. Acting on a tip, Cincinnati Police the next day visited the F.H. Lawson metalworking plant on Evans Street just north of Eighth Street. There they arrested William Shewmaker on a charge of murder, with two affidavits alleging shooting to kill. Held as witnesses were two fellow Lawson employees, Lucien Moore, and Turner Hensley. They were the other clowns. Shewmaker told police he, Moore and Hensley had planned to take a ferry to a party in Ludlow, Kentucky. The weather turned rainy and the trio changed their minds. They were on their way to a street car when the altercation began. The jury couldn’t reach a verdict. They reportedly voted eleven against and only one in favor of conviction on second-degree murder. Failing that, they split evenly on a manslaughter charge, with six voting for acquittal. An effort to convict on assault and battery also failed to find a unanimous vote. Shewmaker, Cincinnati’s killer clown, walked.